Chamonix ski guide office, we are local mountain guides, the Valley Blanche, the Mont Blanc, the off piste skiing are our specialities. Since 1990, our local, experienced and reliable guides (Ifmga & Uiagm) organize your mountain activities all year with taylor made programs. Our activities are Mont Blanc, Vallee Blanche, Off piste and backcountry skiing, Mountaineering, ski and Snowboard, Ski Touring, Glacier Travel, Rock Climbing, hiking for Beginners, Intermediates and Advanced. In Chamonix, skiing the VALLEE BLANCHE is an interesting off piste backcountry descent for intermediate skiers and for experts. Hiring a mountain guide (UIAGM and IFMGA certifications) is the best way to explore Alps and Chamonix Mont Blanc Valley. Vallee Blanche is a high altitude route (3842 meters to 1030 meters) on non prepared snow, off-piste backcountry, on a crevassed glacier. Therefore this descent technical grade is variable and can't be compared to traditionnal ski in a resort. The main aim of Chamonixskiguide is the safety, in despite of false advertisings and the tendency to trivialize, the Valley Blanche is not a blue, red or black trail, it is a big off piste backcountry route (glaciers, high altitude and unprepared snow). If you have doubts about your level in a non aseptic high mountain environment, don't hesitate, hire the guide for one or several days for a good preparation. You will gain experience, you will discover the best descents of the Mont Blanc range and you will be sure to have the conveniant level if you attempt the Vallée Blanche. This 7 questions are important for estimating the level of the less experienced and fit members which makes the global level of your group. 1. How many personns in your group? 2. The ease on pistes (blue, red or black piste) of the less experienced and fit members? 3; The resorts you have been to, and which pistes and off-pistes backcountry you've skied of the less experienced and fit members? 4. The ability among moguls of the less experienced and fit members? 5. The experience or not off-piste backcountry skiing of the less experienced and fit members? 6. The physical condition (which sports, which level, how often?) of the less experienced and fit members? 7. Your tool: ski or snowboard? Attention to not come with a friend to please her or him and end in a trap, it's frequent. Evidently an off-piste backcountry experience will allow you to navigate easily, but we also guide resourceful piste skiers in case not cumulating too many weak points: low fitness level associated with a limited ski level for example. Dates: From Christmas to may, depending on snowfall and mountain conditions. Price: 380 euros for guiding fees a group up to 4 personns (same price for a group of 1, 2, 3 or 4 personns). 30 euros more per extra personn above 4 personns. For the safety maximum 6 personns per guide. The lifts are not included. The cable car is free with an unlimited valley skipass (62 euros for the 1 day unlimited pass including train lifts) and costs 49 euros (one way to Aiguille du Midi) if there is snow down to Chamonix. This shows your commitment and makes sure of getting a high mountain guide on time. Some periods are very busy, so, early booking is essential to be guaranteed to be with a professional. Booking is only validated after having sent a 100 euros draft, through Paypal or bank transfer. The balance will be paid on the day the of the descent. 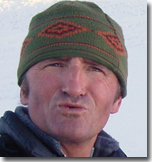 The guide is a professionnal who respects his group and the participants respect also his work. The guide is the only manager of the activities. 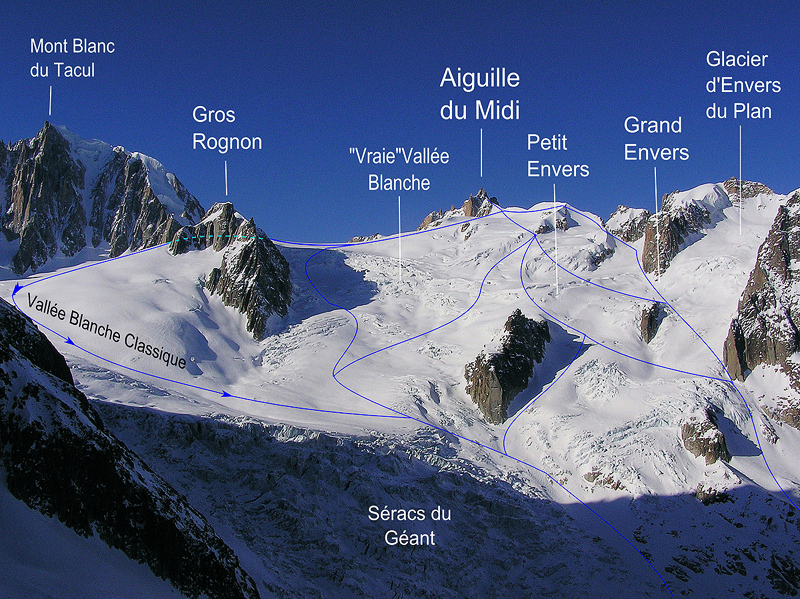 Thus, according to the conditions, the group level or others, the guide can change the program and can propose other descents in the Mont Blanc range. For avoiding any commercial pressure which is harmful to safety decisions, it's essential to allow the guide to arrange the program without losing his day guide. The guide can decide to cancel, In this case, we give back the deposit. The cancellation is decided only by the guide, being in a good place to judge the situation. The Valley Blanche is a route on the glaciers with crevasses in the high mountains from Aiguille du Midi 3842 meters to the bottom of the valley 1030 meters. The greatest descent in the Alps: the Valley Blanche is not a pist, but a high mountain route with unprepared snow on the glaciers, the itinerary is 22 kilometers long and the vertical descent is higher than 2800 meters. All the views are wonderful and the snow and glaciers landscape offers a big impression of wilderness. All for one of the best memories of your life and for an unforgetable experience. When the snow is good, the amazing and beautiful classic route is skiable by solid intermediate skiers (with a small off piste experience). It will be the best day of your stay in our valley on the biggest glaciers of the Alps in the Mont Blanc range. In the middle of the descent, it’s possible to have a break at the Requin mountain hut for a good lunch and a drink. If there is not snow enough in the valley, we will descent by train to the bottom of the valley from the Montenvers railway station. If this is possible, we will ski down to Chamonix. Even if you are a good skier, it’s highly adviced to take a mountain guide because skiing on a so big glacier is a totally different experience: many crevasses are covered by snow and the dangers can be well hided for a non -experienced personn. The Gros Rognon is a quite accessible variant of the classic trip. Just on the left of the classic, the snow is less tracked and there is often some fresh and virgin snow. 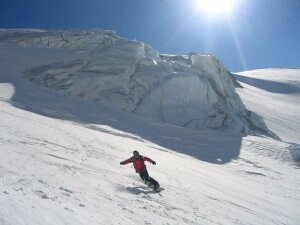 It can be an excellent opportunity to taste your off piste skills in the deep snow. You can join the classic route anytime you want. The Envers du Plan is a very interesting variant: a more difficult and steeper route between the crevasses on a wilder section of the glacier of the Giant. The Envers is one of most classic off piste ski route for good skiers, many options are possible on this part of the glacier. With the Grand Envers, the skiing becomes a big challenge: this route includes a few slopes with an average gradient of 40 45 degrees. You will be obliged to have a perfect control of your skiing and a very good technical level. An unforgettable experience for only excellent off piste skiers. Vallee Blanche is more difficult to snowboard and is reserved for very good boarders, because some parts are not steep and traversing, compulsory for a few of them. Skiers and boarders follow different curves, which makes it difficult to guide both in the same team: snowboard implicating a steeper routes choice, skiers will need a good off-piste ability to follow these itineraries. Therefore it's not possible to mix boarders and intermediary level skiers in a team: this is not manageable. The intermediary level skiers will prefer the classic route less steep slopes, very inconvenient to snowboarders whilst boarders will find easy the Envers du Plan slopes where intermediary level skiers will be technically overtaken. Why is it necessary to have a good level on snowboard? -In the vallée blanche there are a few flat sections and a few traverses where it's very important to loose altitude the least as possible . This is most difficult on snowboard. -For traversing a few flat sections, you must be able to keep speed and control, to anticipate and to analyse correctly the glacier for avoiding the crevasses. -How could it be easier? Wax as welll as possible your board for the temperature of the snow and have telescopic poles. -The snowboarders are generally obliged depending on the quality of snow to ride on a steeper route than the classic Vallee Blanche like the Envers du Plan glacier for exemple. Because of this, it's not possible to mix intermediate skiers and snowboarders, this is unmanageable. 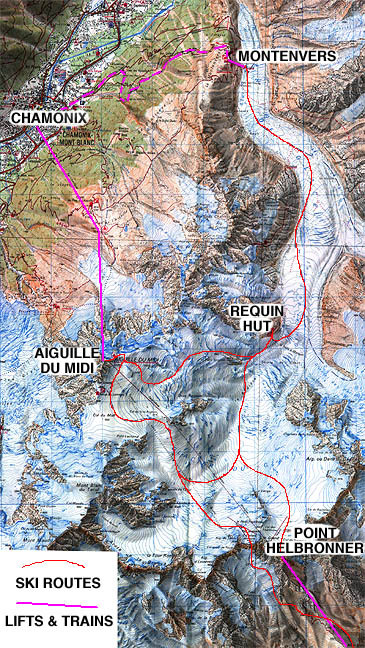 The intermediate skiers will be confortable on the classic route of the Vallee Blanche where it will be too flat for snowboarding. Snowboarders will be OK on a steeper route of the Vallee Blanche like Envers du Plan but it will be too difficult for intermediate skiers. Take care....If you are an intermediate snowboarder there are many easier routes than the Vallee Blanche for nicer and more convenient snowboarding with a guide in Chamonix. Even on glaciers. What helps make the descent easier? You must have telescopic poles and you must prepare as well as possible your board: a good maintenance of your sole with a good wax for the convenient temperature and humidity of the snow. Your guide will contact you (email and phone) the latest one week prior to the descent (if you have booked in advance). In order to give you directly the last information concerning necessary equipment, to speak about your technical and physical level, the meeting time might be fixed by the guide on cable-car busy days or because of the weather forecast, not by the participants. It also will be necessary to give us a phone number you will use in Chamonix in order to allow us to contact you before the descent eventually. A contact in the evening prior to the descent (preferably between 17 and 18 h) will be very important to exchange the latest information concerning the meeting time and place, the descent conditions, to recheck the participants number and their level. If you have to drive a long distance in the morning a rational evaluation of the conditions will be made beforehand to avoid any unnecessary journey. Be on time, half an hour minimum is necessary to prepare yourself after having parked the car, before taking the cable-car. To start at 9 for example, it’s preferable to reach Chamonix at 8:15. There’s a big paid car parking: the Grepon parking is opposite to Aiguille du Midi. When you come from Geneve it’s on right side of first roundabout after “CHAMONIX MONT-BLANC” sign. When you come from top of the valley it’s on left side of 2nd roundabout after having passed the Montenvers small train railway track. A backpack might be useful to fix skis and get both hands free to walk down on the Vallee Blanche starting ridge. Bring some drinks and food even if a stop might be planned at Requin hut in the middle of the descent (about 15 euros per person for a meal). If you opt for picnic on the glacier bring some also for the guide: that’s the tradition. Mont Blanc unlimited ski pass, 62 euros per person will be necessary in case skiing ends near Montenvers train top station. There exists lower prices for people less than 15 years and more than 65 years old , also for families and also in December and April, have a look on “Compagnie du Mont Blanc” site. -Never take off your skis or your snowboard, the preasure on snow will increase and multiplicate the risk of fall into a crevasse breaking a snowbridge. -Keep a mimimum distance of10 meters between each skier. About 20 minutes are necessary to reach Aiguille du Midi, on top we will put on the harness and the transceiver before starting the descent. 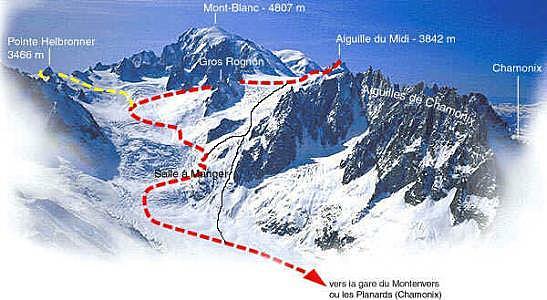 We will rope up to walk down the Aiguille du Midi ridge. The guide will then communicate you the specific glacier skiing information, these rules have to be followed for your safety. We will ski one the Vallee Blanche routes, chosen by the guide, looking at the skiers level, this down to Montenvers train or to Chamonix if possible. We generally come back between 13 h. 30 and 16 h. to Chamonix this depending on participants level. A useful shuttle brings back the skiers to the departure parking close to Aiguille du Midi. An unforgettable week end, discovering two of the main off piste skiing areas in the Chamonix valley : the Grands Montets and the Aiguille du Midi with as a bonus a night spent in the ambiance of a mountain hut, normally very calm at this time of year. D1: Morning. At the Grands Montets (3300 m). Skiing on the Argentière glacier and many other off pist routes of this outstanding ski area depending on your skiing ability. Afternoon,cable car to the summit of Aiguille du Midi (3842 m), then the first part of the Vallée Blanche to the Cosmiques hut for the night. This is not an all included package, you pay only the guiding fees to the guide and the other fees are paid separately and directly to the providers.